Jason Statham doesn't stretch much. He's a tough guy with a gun. Then he uses the gun. Then he cracks skulls via other means that are not gun-based. But then he picks up the gun again and takes care of business because, while he'd prefer not to use that gun so much, evidenced by the part where he put down the gun for skull-cracking with his hands or a brick or a crowbar, the bad guys did, in fact, ask for it and now they're dead. Jason Statham is excellent at all of this. So the question isn't really why he doesn't stretch. The question is why anybody would want him to do that just when he's hitting his stride. He doesn't seem to age. He looked 37 when he started. He looks 39 now. He's the same level of half-bald that he was a decade ago. His facial stubble is exactly the same length at all times. He changes the game a teeny tiny bit here with an attempt at an American accent that makes you want to pat him on the bald spot and say, "Awww, nice try." But otherwise he is an unchanging force, a consistently flowing spring of gruff manners, violence and, on his best days, a really cool London accent. The plot of this gun show involves a little Chinese girl who's also a math genius (Catherine Chan), talented at memorizing long strings of code. She works for the crime bosses of Chinatown but the Russians want her, too. So do the cops. All sides would kill her rather than give in to the other, which brings in ex-undercover cop, ex-cage fighter Statham to protect her. It just so happens that the cops also want him dead or disappeared because his sense of honor couldn't abide their cop-crimes and he ratted them out. This quickly leads to shooting and fighting and running and car chasing, all of it just like everything else you've ever seen before in movies exactly like this. And you won't care. They call movies like this "workmanlike" because they deliver exactly what they mean to deliver, with more or less success depending on the circumstances of its production, with more or less excitement depending on the script and direction and with an always consistent number of people getting their heads blown off. Lots and lots of heads get blown off here. It's not the wild, exhilarating death-frenzy that is The Raid: Redemption, also in current release. Nothing is like that. And if you end up walking out of this with one complaint it'll be that you saw that other one first. But whatever. 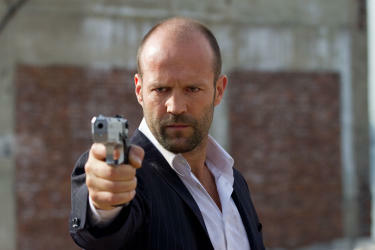 Statham has a gun and he uses it.